One study of public sector employment policies published in 2008 by Hans-Ulrich Derlien and Guy Peters indicates that for many years, the labor market had been kept artificially tight by government policies that replaced disappearing jobs in failing industries with jobs in the government. The financial crisis was the breaking point of an economic system that had grown increasingly more unstable over a long period of time. It was a watershed event that marked the end of an unsustainable structure and the beginning of a new one. 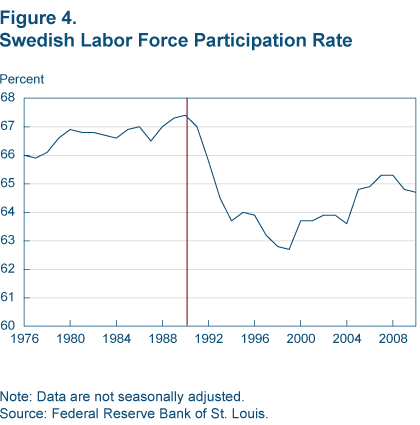 Public sector employment declined from 423,000 in 1985 to 240,000 in 1996 mainly through the privatization of large employers—like the Swedish postal service, the Swedish Telecommunications Administration, and Vattenfall, the electricity enterprise—and it has remained almost flat since then. With such a large structural change, what came before the crisis may no longer be a reference point for what will come after. Having corrected the root of the problem, the Swedish labor market is now operating at a new equilibrium. That doesn’t mean smooth sailing for the United States, as he discusses. 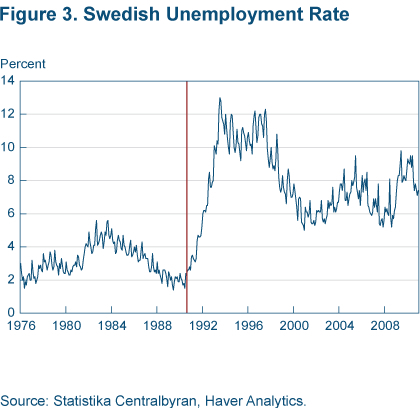 But it does leave hope that perhaps we do better than Sweden in creating jobs in the wake of a financial crisis. Why Is the Economic Recovery So Slow? The U.S. economy has recovered slowly since the official end of the Great Recession in 2009. Mark Lasky and Charles Whalen of the Congressional Budget Office just released a study asking why. 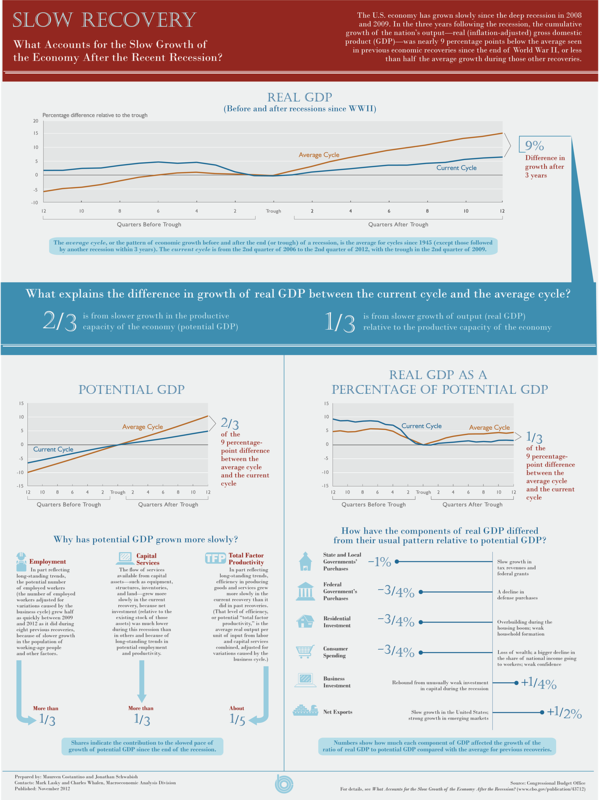 Their answer: two-thirds of the slowness (relative to past recoveries) reflects weak growth in the economy’s potential. The potential labor force, capital stock, and productivity are all growing less rapidly than they did following past recessions. The other third reflects cyclical weakness, particularly in government, housing, and consumer spending. 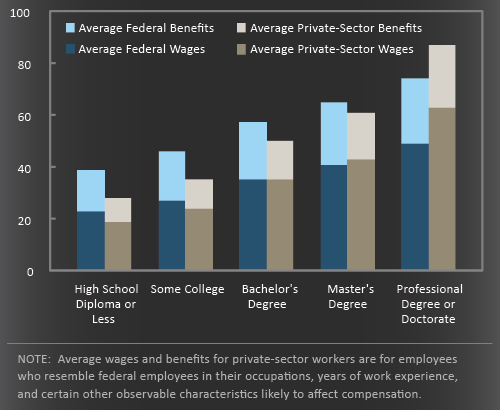 Do Federal Workers Get Paid More Than Private Ones? Yes, according to a new report by the Congressional Budget Office. As always in such comparisons, however, there are some caveats. Of course, a lot is riding on the phrase “certain observable characteristics.” CBO did an extremely careful job of measuring total compensation and of controlling for observable factors such as education, age, and occupation. But many other factors are impossible to measure. CBO’s summary mentions effort and motivation. There are also issues such as job security and developing valuable skills and knowledge.